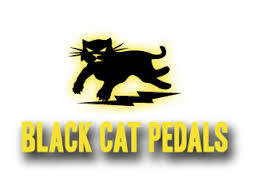 Black Cat Pedals was founded in 1993 so compared to most pedal brands they been around forever. Black Arts was there at the beginning of the Boutique Pedal boom. Black Cat has customers world wide, players include Eric Johnson, Billy Gibbons, Trey Anastasio (Phish), Scott Henderson, Steve Lukather, Michael Landau, and many more. Black cat discontinued prodcution in late 2007 however the company has been rebuilt from the ground up and they've revamped the entire Black Cat pedal line. The current pedals are based on original BC designs with upgraded components and uber high build quality. The're still hand wired and still made in the USA. Black cat is back bigger and better than ever. We're an authorized Black Cat dealer. We ship most pedal brands world wide. Buy black cat pedals and effects online, give us a call or drop by our Chicago guitar and pedal shop.